Zak Allen saves a free kick. The senior goalkeeper has been successful on the field as of late, and his work in goal is part of the reason the Cats are right back in the conversation to make the NCAA Tournament. 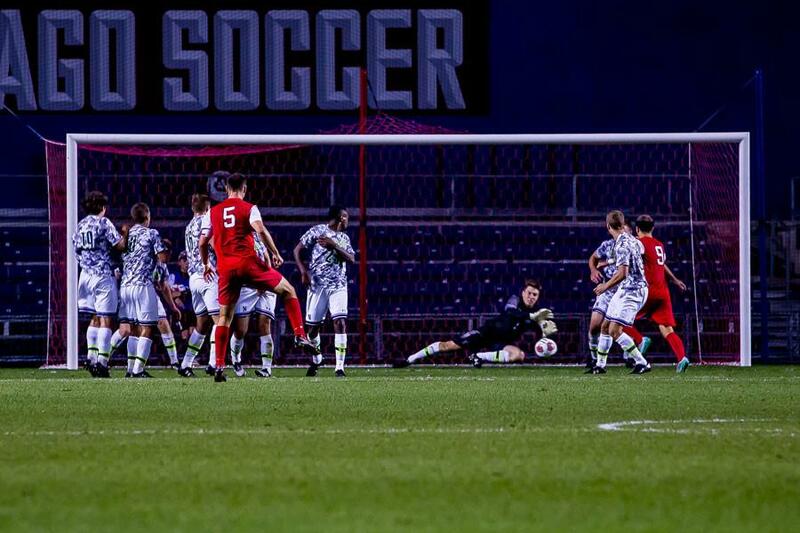 Senior goalkeeper Zak Allen’s second shutout of the season could not have come a better time. Allen made seven saves, including four in the second half, and junior forward Mike Roberge delivered a headed goal in the 89th minute to lift Northwestern (6-6-2, 2-3-0 Big Ten) to a dramatic 1-0 win over Michigan State (7-6-2, 2-2-2) on Saturday’s Senior Day. After turning aside a career-high 12 shots in Tuesday’s 1-1 draw against Notre Dame, Allen concluded a fantastic week by recording his first clean sheet since a 1-0 win over Central Florida on Sept. 14. His 71 saves on the year lead the Big Ten as of Saturday. “Not having played for the past three years, and then coming in my senior season and playing all of the games, culminating with this Senior Day … it’s been really special,” Allen said. A perfectly conducted set piece — directly out of this past week’s practices, much like their game-tying play earlier this month versus Maryland — proved sufficient for the deciding goal with one minute and two seconds left in regulation time. Standing over a free kick opportunity from just outside the 18-yard box, freshman midfielder Camden Buescher lofted the ball near the far goalpost to senior defender Henry Herrill, who headed the ball back into the center of the goalmouth and onto the crown of Roberge. The Pennsylvania native then knocked the ball past Michigan State goalkeeper Zach Bennett and into the net. With the wind at Toyota Park against them in the first half, the Wildcats sought to merely reach halftime with the scoreboard still showing a pair of zeros. Michigan State seemingly broke that plan in the game’s opening minutes, but an apparent goal was called back for offsides. NU was out-shot even more heavily in the second frame — the shot attempts count favored the Spartans 7-4 in the first half and 9-2 in the second — but, as has been their strategy frequently this year, the Cats instead looked for opportunistic counter-attacks. They found one in the 61st minute, but junior forward Getenet Tuji’s try sailed high. Allen almost singlehandedly kept NU alive in the following stretch of time, making three saves between the 62nd and 73rd minutes. The win marked a triumphant Senior Day for the team’s eight oldest veterans. The win also made a massive impact on the Cats’ NCAA Tournament hopes with three games left in the regular season. The team’s RPI jumped from No. 61 at the beginning of the week to No. 35 following Saturday’s victory. Forty-eight teams are invited to the tournament, with RPI being a major factor in the process.